After several decades of development, Crane Structural optimization technology becomes more and more natural, and its good economic performance, in the field of machinery has been widely used. As a large-scale construction machinery, gantry crane can be used to optimize the structure of its metal structure to achieve the purpose of the lightweight structure. At present, many crane enterprises and some colleges and universities such as Southwest Jiaotong University, Dalian University of Technology, Zhengzhou University and other universities are making cooperation on the optimization of the metal structure of the crane and have done a lot of research. Taking the L-type gantry crane as an example, the performance index of the mast is programmed into the program, which is optimized with I SIGHT. The multi-island genetic algorithm is used to optimize the mast. Then, based on the finite element method, the optimal design of the gantry is carried out. The advantages and disadvantages of the two optimization schemes are analyzed by comparing the two optimization results. Fan Li Ge combined with the sensitivity analysis technique and the structural optimization design, the parameters with great influence on the total volume of the metal structure of the gantry crane are selected as the design variables, and the optimal design of the structure is completed. Tang Hui firstly took the main gantry as the mast for cross-section optimization, followed by a non-symmetrical outrigger structure to achieve the weight of the crane design. CUI Hua-wei took VB as the development platform, the gantry structure model was established by using APDL language. Based on the static analysis, the maximum equivalent stress and the cantilever deflection were used as the state variables to optimize the gantry structure. On the basis of static analysis of gantry crane, Wang Zhixin has optimized the structure of crane main girder. Chen Guanshun introduced the dynamic displacement as the constraint condition to optimize the design of the gantry crane structure, thus reducing the weight of the gantry crane. Summer aluminum using a genetic algorithm for the gantry crane main beam was optimized design, the crane weight reduced by 11.4%. The structure of the cantilever beam of the gantry crane is optimized by the combination of genetic algorithm and structural optimization technology. Qi Qisong has optimized the main girder structure with some cross-sectional dimensions of the main girder of the gantry crane as the design variable. Sun cave looked at the lower beam of the crane. In the ANSYS, the simplified finite element model of the main girder of the crane is established, and the weight of the main beam is reduced by 18%, and the weight of the main beam is reduced by 18%. ZHANG Xiao-li (School of Mechanical Engineering, Zhejiang University, Hangzhou 310027, China) used the application of multi-objective genetic algorithm in engineering, and the genetic target optimization algorithm based on Pareto ranking is developed. The topological optimization of the main beam was carried out by means of ANSYS software, and the topological optimization model of the initial concept of the main girder was obtained. Cheng Lizhu uses ANSYS software to use the main beam height, width, the thickness of the upper cover plate, the thickness of the lower cover plate and the thickness of the left and right webs as the design variables. The vertical deflection and equivalent stress of the main girder are the state variables, and the total mass of the main beam is the lightest as the objective function, the main beam size optimization, optimized weight reduction of 29%, the effect is more obvious. Meng Wenjun uses ANSYS software to model the main girder and end girder of the crane. The LHS of Mote-Carlo is used to analyze the sensitivity of the crane’s metal system, and the structural parameters with great influence on the bridge are found. Under the premise of ensuring the reliability, the dimensions are optimized. The total weight of the crane reduces to 7.3t. The model of the gantry crane is established in ANSYS, and the effect is optimized. 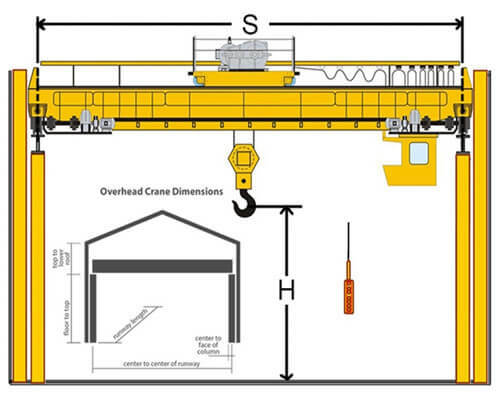 Better than the previous weight reduction of 18.9%, Naresh Chauhan analyzes the stress and strain of the overhead traveling crane. Zhao Qiong established an optimization design model with the key parameters as design variables and proposed an optimization method based on genetic algorithm and finite element analysis. 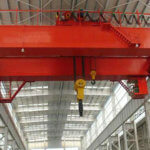 By optimizing the four-bar luffing mechanism, the production cost of a gantry crane and operating costs. Fan chaos theory is introduced into the optimization design of CMS, which saves the computation time and improves the computational efficiency compared with the previous ant colony optimization algorithm. Fan, Xiaoning The sensitivity analysis of the uncertain variables of the bridge crane is carried out. The optimal design model of the overhead bridge crane based on reliability is constructed. Under the premise of satisfying the working performance, the design structure is compared with the traditional design phase, and the weight of the crane is much reduced. Kim and so on the crane boom support structure to establish a three-dimensional model, the use of HyperWorks software to its topology optimization. Ellsen always decade itself in most advanced crane technology for providing best excellent crane products for the worldwide customers. With the above research theories’ support, Ellsen Crane Machinery can manufacturer different kinds of cranes, featuring in smart, light duty and high-performance structure, which can easily promote your working efficiency to a large degree.